Director Neasa Hardiman is directing the two part finale of the BAFTA-nominated ITV police drama ‘Scott and Bailey’, currently airing on ITV. IFTN talks to Neasa (‘In The Club’, BAFTA-winning ‘Tracy Beaker Returns’) about how her directing style and the show’s specific tone are in ‘perfect alignment’, how she landed the season finale, the show’s very authentic female characters, her directing style, her upcoming film projects and some advice to budding filmmakers. 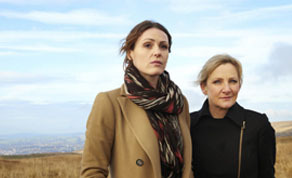 ‘Scott and Bailey’ revolves around the personal and professional lives of DC Rachel Bailey and DC Janet Scott, both of whom are members of the Major Incident Team of the fictional Manchester Metropolitan Police. The two part season finale is due to air on ITV on October 22nd and October 29th. How did directing the season 4 finale of ‘Scott and Bailey’ come about? Well, I suppose it came from work that I had done directing ‘In The Club’ on BBC. Red Productions, who are one of the preeminent independent production companies, contacted me after they saw that and things went from there and it really was the most fun to do. This is such a huge show for ITV and Red Productions and the actors are brilliant, the writing is fantastic and so I was delighted when I got the call. You know, it’s a murder drama but it’s not a case of this just being another murder drama. They’re dark, gritty stories but they all dawn from something truthful and have a lot of emotional depth. It’s very authentic and real, never melodramatic and has a lot of humour to it. It’s not interested in the whodunit like so many other shows, it’s more interested in the more murky and human element of why people do what they do. This show has really raised the bar for British drama. The show has a very specific style and tone, how do you balance keeping the tone of the show and leaving your own unique stamp on it? First of all, as a director you can’t help but leave your fingerprints all over your work. I am definitely going to look back over this and know it’s my work. In saying that though, ‘Scott and Bailey’ definitely does have a very unique tone. It’s noir-ish, it’s gritty and it definitely does have a very consistent and specific voice throughout the series. But for me, it was just a very happy merging of styles. It’s very close to my own aesthetic. I want images to be strong and powerful and to resonate with people and use those images to tell the story in a powerful and meaningful way. I think the ‘Scott and Bailey’ voice has been very like mine in that regards and I feel the ‘Scott and Bailey’ world is definitely one that I inhabit. I suppose this show differs from other Police shows at first glance because it features two female characters in the lead. The female characters in this show are flawed and three dimensional, as characters have been in your other work. Did that draw you to this project at all? Yes, definitely. I love getting under the skin of characters and I love how strong the writing has been for the female characters on this show. They’re two very different women and I love the fact that the show has never been about the fact that these are two female detectives and the difficulties of that. These women are not defined by sexuality. They’re both deeply flawed, can be violent and they’re both just fully rounded, three dimensional people and women which can be rare in mainstream dramas. As a director, this was great to work with and I really was working with actors at top of their game with Suranne Jones and Lesley Sharp. They were a joy to work with and always ready to experiment with any ideas I brought forward. I have written a script called ‘Sea Fever’, a Science fiction thriller about seven people who get marooned at sea. They are caught on a trawler as a deadly parasite infects the water. I really wanted to create something within the sci-fi genre that had very rich and layered protagonists. That’s being produced by Fantastic Films and is backed by the Irish Film Board. I then have another project in the pipeline which is being produced by Grand Pictures and backed by the Irish Film Board. It’s about Maeve Brennan, the Irish writer, and it’s about the portion of her life spent in New York. It’s a very emotional, strong story. I also have a third screenplay backed by the Irish Film Board and that is one I am writing at the minute. It’s a thriller grounded in atomic physics and big businesses and the conflict there. So, I am very excited for all of them. Finally, do you have any advice for any budding filmmakers? My only advice is to work. You just have to keep working. I mean, when I started in the 90’s I did all I could to just keep working and I really cut my teeth at RTÉ. I devised, wrote and directed documentaries, staying up half the night making sure they were right. I worked on the Eurovision, arts documentaries, anything I could. I became the youngest ever director of Fair City. I learned so much by that approach and I believe you only ‘get good by doing’ in this game. Storytelling is a practice. You can have the talent, the creativity and originality and whatever else but ultimately storytelling is a craft and my advice is to keep working and working.